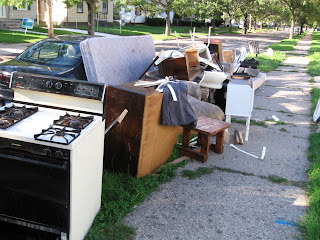 thanks for the info....i am a landlord..i live in warrendale and rent out a real nice house over in copper canyon.. ann arbor trail/warren......i am going through the eviction process for the first time right now...and it is pure HELL!! !.....not only do the tenents not pay their rent...they ruin the house..then we have to pay for this whole eviction process...with the baliff fee and this new dumpster policy.....im a really good landlord..and rent out a house that is in someways better than the one i live in......the problem is not with the landlords ,its with the dreg tenents....we invest in the neighborhoods...just to have the scums ruin it....of course their are some bad landlords..but they didnt start off like that...this dumpster thing is going to be a real hit in the pocket book..but its the law and i will obay...but after 48 hours it will be LONG GONE!!!!! crack houses need to be evicted. drug supply and they will leave. towards Rouge Inn or Halligans.